Arrive at Kathmandu International Airport. And transfer to the hotel. Overnight at hotel. Located at 1365 meters altitude, Kathmandu, the "City of Glory" was still the capital of Nepal kings and reached the peak of his artistic development in the late 18th century. The very religious character of the people favored over the centuries the construction of many religious monuments of all sizes. Morning tour of the old city of Kathmandu Hanuman Dhoka, the former Royal Palace, Durbar Square, the historic Place Royale. The residence of the child goddess Kumari, the wooden building is one of the finest in the city. Then, drive to the stupa of Swayambhunath Buddhist shrine located on the heights of the city. 2500 years old, it is one of the oldest stupas in the world. In the afternoon, drive to Patan, ancient city called the city of Fine Arts, with its medieval streets, strewn with palaces and red brick pagodas. Continue to the Tibetan refugee camp and craft center where you can admire the art of weaving and carpet factory. Back in Kathmandu. Overnight at hotel. Morning drive to the Pashupatinath Hindu site. His temple, dedicated to Lord Shiva, with roofs covered with gold and finely crafted silver doors is famous for its beautiful architecture. On to Bodhnath stupa and its huge white, center of Tibetan Buddhism, the second after Lhasa attracts believers worldwide. Built in the 7th century, the stupa is surrounded by countless prayer flags shimmering and about 650 prayer wheels. The picturesque Bhaktapur, the city of Devotees, shaped like a conch, is considered an open air museum where all the streets are amazing as each other. A stroll through its streets is needed to discover monuments and live workshops of pottery, weaving and woodcarving. Then, towards Nagarkot, a small village perched at 2190 meters, which is by far the site that offers the most breathtaking view of the majestic surrounding mountains because of its exposure: 300 km of snow-capped peaks of sight during nice weather. Overnight at hotel. Morning drive towards the famous city of Pokhara 200 kilometers west of Kathmandu. This is one of the most scenic places in Nepal. The scenery along the route are spectacular. Arrival in the enchanting city located 900 meters above sea level, known for his views on the Annapurna range just 40 kilometers as the crow flies. The city is magnified by its majestic lakes Phewa, Begnas and Rupa that have their sources in the glacier region of Annapurna. Lakeside around Lake Phewa, is the most picturesque place of the city's most vibrant neighborhood. We also can take pleasant walks or bike along the lake. Ride an hour in a small rowboat (Doonga) on the lake, one of the most extensive of Nepal. Overnight at hotel. Early Sunrise and management Sarangkot to attend the magnificent spectacle of the sunrise. The view around is superb, mixing mountains, snowy peaks, sunken villages and lakes scattered throughout the landscape. The ridge, you can see all the Pokhara Valley and Lake Phewa. In the afternoon, visit Pokhara and its surroundings. The cascade of Davy, Bindebashini the temple, one of the oldest temples in Pokhara, Gupteswor Mahadev Cave, one of the most extensive in the country and the beautiful cave Mahendra, also one of the main attractions of Pokhara. Overnight at hotel. After breakfast, drive to Chitwan National Park, located in the Terai region in the south, in the heart of one of the major forest regions of Nepal. Chitwan, the oldest game reserve of the kings of Nepal, was created in 1973 to preserve a unique ecosystem and extremely valuable to the world. This place of preservation of endemic species home to the last-horned rhino, white rhino, Bengal tigers or the Gharial crocodiles, crocodile Asian recognizable to its highly elongated jaws. Overnight at hotel. Day in the Chitwan Park to discover the jungle safari, hiking, ride an elephant or canoe. Overnight at hotel. In the morning, return to Kathmandu. Afternoon stroll in town to enjoy these streets with countless boutiques, these houses with carved balconies and these beautiful temples and palaces. Overnight at hotel. Transfer to airport for flight to Kathmandu and Paro in Bhutan. Drive to Thimphu, the capital of Bhutan. 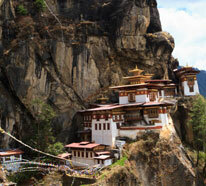 Before arriving in Thimphu, stop at Kuensel Phodrang, the "Buddha Point" overlooking the entire valley where the country's largest statue of Buddha is located. A Thimphu, visit the mini Takin zoo, which houses the National eponymous animal, exclusively present in Bhutan. Then walk in Norzim Lam, the main street lined with craft shops. Overnight at hotel. Road to the smiling Punakha valley through the pass of Dochu it to almost 3100 meters. From there on a clear day, the view of the Himalayan ranges is breathtaking. Stop at 108 chortens, stupas, built on the hill to the King of Bhutan and Druk Wangyal Lhakhang visit a temple built in homage to peace and stability provided by the fourth king. 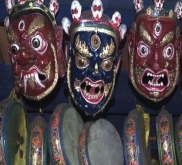 Then visit the Monastery of the Divine Madman, Chhimi Lhakhang, famous for its sanctuary of the 15th century. This professor owes its reputation to the various types of education. Continue to Punakha, the former capital of Bhutan from 1637 to 1907, when the civil architecture is remarkable finesse, sobriety and elegance. Overnight at hotel. Ascension by a steep path up to the assault of the cliff where clings, defying the vacuum, the Monastery of Taksang dubbed the Lair of the Tiger. Perched at 2 800m above sea level, this is one of the most revered shrines in the Himalayan world. It is possible to play a game of Wasps (payable locally) but the descent is not done on foot. Back in the Paro valley and on the way visit the monastery Kyichu Lhakhang, one of the oldest monasteries in the country reflecting the introduction of Buddhism. Overnight at hotel. Morning transfer to Paro airport for flight to Delhi. Centrally located, just minutes from great shopping malls and restaurants. Very welcoming and helpful staff. The rooms are comfortable and well equipped. Breakfast is fantastic. A good 3 * + to stay in Kathmandu. Nice hotel with a magnificent view of the Himalayan chain. The rooms are large and comfortable and also being luxurious. Friendly restaurant with good quality food. Pool and jacuzzi facility with a very effective massage parlor, all in a relaxed atmosphere. Calm and serene idyllic location with nature setting. At the foot of the mountains, on an island . Crossed by boat to the hotel. Spacious rooms elegantly decorated. Warm welcome and excellent service. Swimming Pool. A paradise in the middle of the jungle. The cottages have all the amenities and the food is superb. The rooms are bright, spacious and nicely decorated. The staff is attentive and very helpful. Pool and spa. A whitewater adventure, or Rishikesh to Haridwar? Accompanied by a qualified guide, you will live a unique experience down the rapids of Ganga. Several levels of difficulty make this activity accessible to everyone.